The team at David Nieper fashion house in Derbyshire is challenged every season to come up with a new collection of luxury styles for discerning customers all over the world. 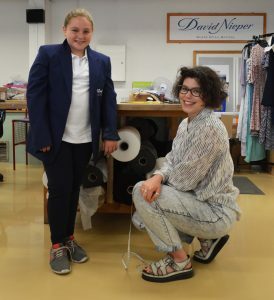 However, this season the team was tasked with one of their biggest design challenges to date, when they were asked to redesign and reconstruct a school uniform for a Year 7 student, starting at the David Nieper Academy. Laura Worthington measuring up for Libby’s new uniform. Libby Whitehouse, age 11 suffers from a Sensory Processing Disorder (SPD) which means she is hypersensitive to wearing clothes and wouldn’t normally be able to tolerate something as restrictive as a school uniform. David Nieper, Managing Director, Christopher Nieper challenged the grading team to come up with a design solution that worked for Libby so she felt as comfortable and smart in her school uniform as her classmates. SPD is a neurophysiological condition where the brain and nervous system have trouble processing or integrating stimulus. It is common for children with SPD to be intolerant to textures and often they are not be able to wear certain fabrics, or have to wear clothes inside out to reverse the seams. “It’s daunting for any child to start a brand new school, but for Libby because of her SPD we were worried that the whole experience would be overwhelming, we knew Libby’s main concern would be her uniform. She was dreading wearing a shirt, tie and blazer as she knew the sensations would be unbearable, but at the same time she was adamant she wanted to be the same as everyone else. It is the job of the David Nieper grading team to ensure that clothes are made to be the perfect fit. So, after spending time with Libby and her mum they started the redesign by taking apart a David Nieper Academy school uniform and piecing it together in a way that Libby would find comfortable. A regular sized blazer was no good for Libby as she found it too constricting. The team selected an oversized blazer which was taken apart and shortened; more panels were added to the lining which was reshaped to give her more room around the arms, this allowed more space to move without the fabric pulling. The trousers were trickier – school trousers are required to be durable and hardwearing, usually made from a synthetic reinforced fabric such as polyester. Libby was unable to wear this type of fabric, so after several attempts at reshaping the trousers the team opted for soft jersey trousers from the David Nieper collection, these were quite similar to the fabric of Libby’s sportswear and after alteration were a perfect fit.